The goals of the AORE - AEE 2019 Conference include broadening collaboration within the fields of experiential education and outdoor recreation, creating higher-quality educational opportunities, building professional skills and knowledge, strengthening professionalism within their memberships, broadening networking opportunities, leveraging both communities in advocacy and public policy efforts, and raising awareness of the value and impact of experiential education and outdoor education. Those attending the conference include practitioners, instructors, program administrators, military personnel and clinicians in both the outdoor and recreation industry and the experiential education industry. Participants will find the conference is the year's most important event for career development. For several days in mid-November, we will come together to share ideas, learn new techniques and re-energize for another year. The AORE - AEE Conference is the gathering of friends and colleagues, a place to improve performance and meet new people in your field. Each year, the conference changes bit by bit to meet the needs of our members and the industry as a whole. We provide a handful of standard programming options and sessions in addition to unique opportunities each year. Our selection of keynote speakers and education session topics comes from the most qualified, relevant, and timely presentations submitted. Below is a glimpse of some of the types of programming you can expect to see at the 2019 conference. Our call for presentations is expected to go live by the end of February - please check back soon! From half-day to multi-day options, our pre- and post-conference workshops give attendees a one-stop shop for industry training and certification renewals, certainly adding to the many perks of attending the conference. Between general education breakout sessions, shorter "snap" education sessions and longer deep dive sessions, we are excited to be able to offer an extensive selection of valuable content and experiences for attendees. Watch for our call for presentations in February and a final schedule as we get closer to the conference. Situated in the heart of it all, our Exhibitor Hall is packed with equipment outfitters, training companies, guiding companies and more--all there to network with attendees. This gives our attendees the opportunity to ask questions, compare price points and use that information to negotiate and leverage opportunities during face-to-face meetings. AEE is excited to bring their ActivatEE program, TEDx-style presentations, to the 2019 conference. What better way to kick off an event then to hear powerful stories from the field, from your colleagues, about their own expeditions at work and in life that have led them or those around them to better health and wellness?! Our Activate session will be developmental for both the speaker and audience, where ideas are shared, assumptions are tested, and we ask attendees to view a perspective through a different lens. If you're interested in the origination of this session, check out this page on AEE's website: https://www.aee.org/activatee. At the CareerHQ, attendees can browse graduate assistantship, internship, full-time position and summer position announcements from organizations and programs across the country. Attendees are welcome to drop off their resumes for potential employers to pick up ad sign-up for one-on-one mock interviews and resume review sessions. Sometimes a more informal discussion session with like-minded colleagues or those experiencing similar challenges, become the most memorable parts of a conference. AORE and AEE are bringing together these facilitated discussion sessions to serve that very purpose and we're looking forward to sharing our finalized list of topics as we approach the conference. AORE's Research Symposium strives to connect academics and practitioners of the outdoor and recreation field. The symposium provides an international forum for scholarly exchange and discussion about outdoor recreation and education research, theoretical and applied and creates an amazing opportunity to bridge research and practice. AEE's SEER program (Symposium on Experiential Education Research) provides an outlet and venue for researchers in the field of experiential education to present, share, dialogue, and further develop their research ideas. The symposium includes the presentation of research papers from leading international scholars in the field of experiential education. If you’re not ready for a full-on research presentation, our poster presentations are a great opportunity to share your work in a less-structured environment. Posters are displayed throughout a common area at the conference venue. We provide a short time where poster owners can do an informal presentation to those interested in their research. MEETINGS, NETWORKING EVENTS, SOCIALS AND MORE! Demo Day is moving to the LAST day of the conference so everyone has a chance to explore our great outdoors with vendors. This is an interactive event to encourage healthy, active outdoor recreation to complement the Annual Conference. By combining the things outdoor enthusiasts love – food, hiking, music, gear, biking, and demos all in a beautiful outdoor setting – Demo Day is a celebration of everything outdoors. Both associations will spend time bringing their committee groups together for onsite work and planning for the following year. In addition to these small meetings, each association will meet separately for official business. The preeminent student and professional networking event. Meet up on site at the designated location to get paired up with a professional. They pay for your lunch and you get to chat about their path, where you are, and how to get where you want to be. This is your chance to take home incredible industry books at a fraction of the cost. New for 2019 - books will be available for direct purchase from the start of the conference until they're gone! The National Outdoor Book Awards (NOBA) is the outdoor world’s largest and most prestigious book award program. Each fall in early November, the NOBA Foundation announces the winners of the ten categories making up the program, including History, Literature, Children, Nature, Natural History, Instructional, Adventure Guidebook, Nature Guidebook, Design and Outdoor Classic. Copies of these books plus other nominated pieces are sent our way. You benefit by getting books at a low cost. We benefit by contribution a portion of the proceeds to our Fund for Student and Professional Development, and NOBA benefits by receiving a portion of the proceeds as well. Open during the Exhibitor Hall, proceeds from the Silent Auction go toward the Fund for Student and Professional Development. Be sure to stop by and put in your bids*! Join us for an evening of food, music, and entertainment with our live auction. Preceded by a social hour to mix and mingle, this dinner and awards presentation recognizes the many leaders in our fields. AEE Associaton Award winners and AORE Association Award winners will be recognized, as well as other special honorees including board members, committee members and our conference leadership team. The 2020 conference date and location will be unveiled. Business/professional attire. Purchase a ticket for your guests for $55. *Donors who purchase items at a charity auction may claim a charitable contribution deduction for the excess of the purchase price paid for an item over its fair market value. The donor must be able to show, however, that he or she knew that the value of the item was less than the amount paid. 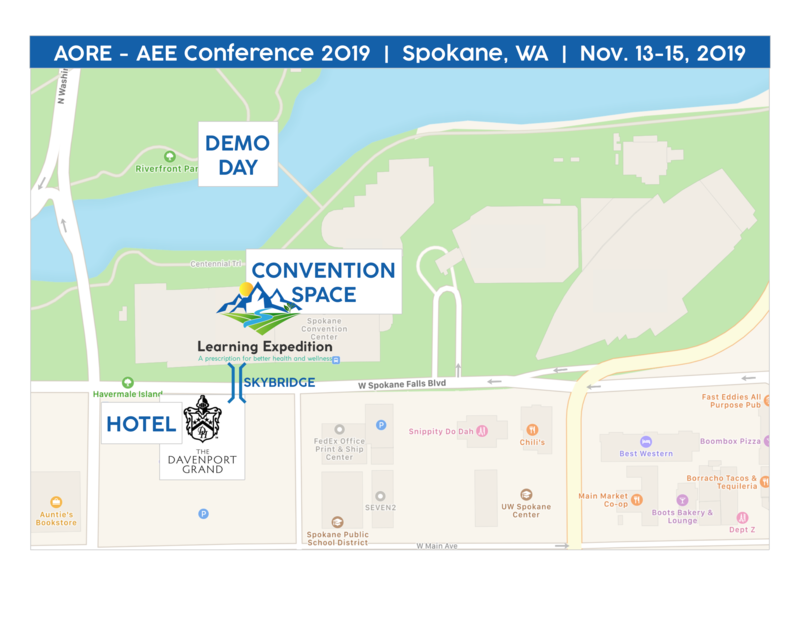 Get the lay of the land - click the image below to see a full-size version of where the convention space is, how close the Davenport Grand is, how to get across to demo day, and some local sights to see.